The Florida Highway Patrol (FPL) reported that two people were in critical condition following a crash on I-75 near mile-marker 57 on Monday, January 21, 2019. According to the FPL, a vehicle was improperly stopped on the outside lane of I-75 northbound when the car was rear-ended by another driver who failed to stop. The accident resulted in a vehicle fire. Accident vehicle fires are very dangerous and require immediate action to rescue drivers and passengers. 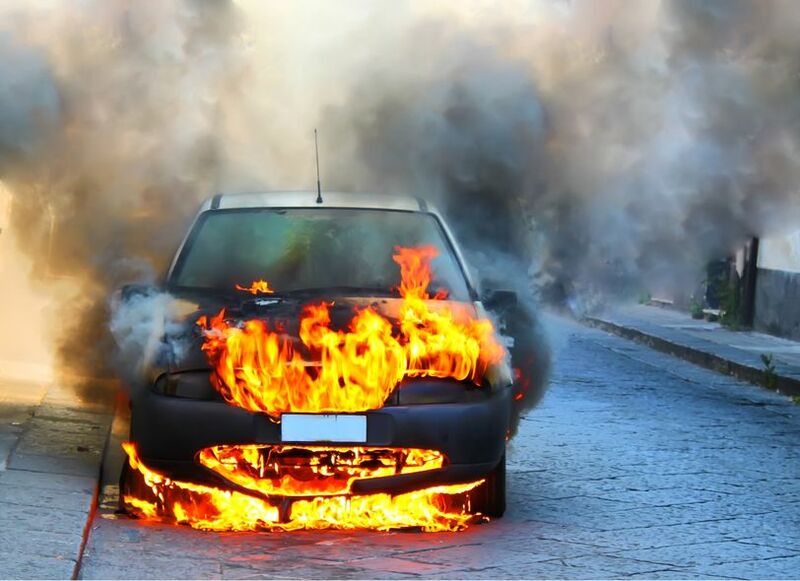 When traffic accident fires happen, they can cause residual fires, injuries, and even deaths. The National Fire Protection Association (NFPA) issued a research report in September 2017 titled “Fire Department Roadway and Vehicle Incidents.” Based on 2014 data from local fire departments, the report said the departments responded to an estimated 4.461 million incidents on roadway properties, including parking lots and driveways. The U.S. Fire Administration’s (USFA) National Fire Incident Reporting System showed that 27 percent of the incidents were on highways or divided highways and 24 percent were on residential streets, roads or driveways. Of these 2014 accidents, 129 thousand were vehicle fires. What to do in case of a roadway vehicle fire? First, get yourself and all others out of, and safely away from, the vehicle. Never attempt to get back into the vehicle to retrieve personal property. Call your fire department at 911 or your local emergency telephone number. Next, if you choose to use a fire extinguisher, do so at a safe distance from the vehicle and use a fire extinguisher approved for Class B and Class C fires. In addition, never open the hood or trunk if you suspect a fire under it, as air could cause the fire to enlarge. Finally, at all times, be aware of other vehicles on the roadway and never stand on an active roadway as there is the potential danger of being struck by another vehicle. “Should you or a loved one be injured in an accident, please seek medical attention first, then contact our experienced team. We are available 24/7 to assist you, and there are no costs or attorney fees unless we make a monetary recovery for you,” said Randall Spivey, Naples Car Accident Attorney, Spivey Law Firm, Personal Injury Attorneys, P.A. Naples Car Accident Attorney, Randall L. Spivey is a Board Certified Trial Attorney – the highest recognition for competence bestowed by the Florida Bar and a distinction earned by just one (1%) percent of Florida attorneys. He has handled over 2,000 personal injury and wrongful death cases throughout Florida. For a free and confidential consultation to discuss your legal rights, contact the Spivey Law Firm, Personal Injury Attorneys, P.A., in Lee County at 239.337.7483 or toll free at 1.888.477.4839,or by email to Randall@SpiveyLaw.com. Visit SpiveyLaw.com for more information. You can contact Spivey Law Firm, Personal Injury Attorneys, P.A.in Charlotte County at 941.764.7748 and in Collier County 239.793.7748.